Israeli residents suffer shortage from Arab pirate connections to water company pipes. Yehuda Reines, a veteran farmer who lives in the northern Jordan Valley town of Mehola, told Arutz Sheva that the residents of the area face a severe water shortage which causes thousands of acres of agriculture to remain completely dry because of the water theft perpetrate by Arabs living in nearby villages. The water theft is carried out systematically all year round, but in recent days it seems that the theft has reached record levels. "There is no water in the morning in all the agricultural areas," Reines said. He explained that there is a water drilling site near [the town of] Mehola, which was established in the 1970s. and since then the Arabs have been setting up pirate connections to steal water from the Mekorot [water company] pipes. According to Reines, the thefts had been relatively small-scale and did not concern the residents very much until relatively recently. The Arabs have reportedly begun to steal vast quantities of water recently. "There is drilling of 1000 cubic meters per hour. 60-70% go to the Arabs, and the rest they steal. Therefore, on a hot day, it is impossible to find water, and it is possible that tomorrow there will be no water in our houses." "They connect to the main pipe and steal the water. Mekorot told us to 'turn to the Civil Administration.' but the director does nothing and says that Mekorot must handle the theft of the water along with the police. "This is a country that has lost power. Every word I add is superfluous. Fifty years of settlement? Fifty years of disgrace. This is nothing else like it," he said. "Uri Ariel is the only one who tries to help. The defense minister is not doing anything. The Ministry of National Infrastructures does not do anything. The Civil Administration is the worst of them all. Each one blames the others, but in the end we don't have water," he lamented. Reines, who grows spices for a living, said that even after Mekorot came to destroy the pirate connections to its water pipes, "one day later, the Arabs come to reopen them. They laugh at the Israeli government. If I stole water in Tel Aviv I would go to jail, but here anything goes. It is ignored." "Our seedlings do not understand the sense of humor of the Civil Administration and Mekorot. The Arabs next to us are processing thousands of dunams with stolen water and our seedlings are disappearing," Reines added painfully. Mekorot responded to Arutz Sheva's request for comment by saying that the water shortage in the last 24 hours was due to a malfunction in the electricity supply. However, Reines believes that this is a minor problem and the main reason for the lack of water is Arab piracy. The Civil Administration said in response: "The full responsibility for the water lines and enforcement in this area is that of the Water Authority and Mekorot." 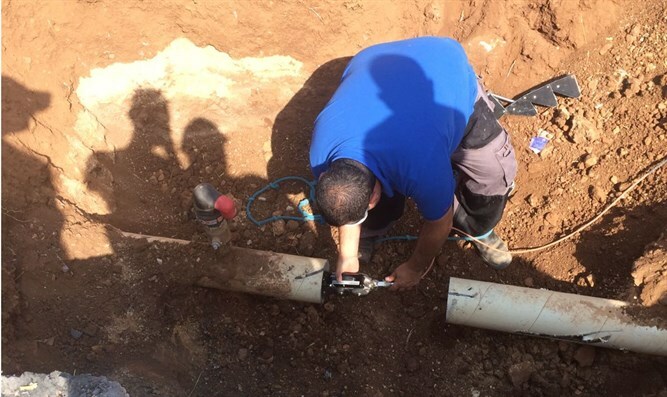 "The Civil Administration mobilized heavily and assisted in enforcement, and only in recent months, under the leadership of the Civil Administration, there were two operations to disconnect pirate water connections in Area B in the village of Bardala in the northern Jordan Valley. The Civil Administration will continue to operate in this field."